Share Hudu Rising Blues Band's EPK! Max Filazek (Lead Electric Guitar) - Max has developed his own style of Blues Guitar and loves to run through various scales to achieve his sound. Max plays with a confidence and proficiency beyond his years. Max has been studying Flamenco Guitar since 2006, with Flamenco Master Ruben Diaz, who was in turn, instructed by Paco De Lucia himself. Max recorded his first CD, â€œDiez Anosâ€?, a Flamenco guitar CD, when he was 10 years old. His musical influences: Stevie Ray Vaughn, Eric Clapton, John McLaughlin and Pac De Lucia. 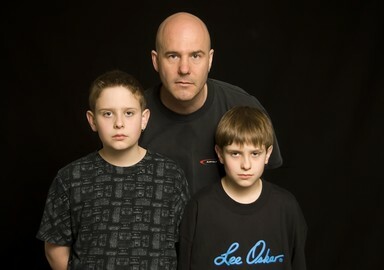 Glen Filazek, Hudu Rising Blues Band founder, and his twin boys Max and Arlo have been playing music publicly since 2004. They began playing folk and Country classics by artists such as Bob Dylan, Elvis Presley and Johnny Cash. The transition to â€œBluesâ€? music happened quickly as the budding talents of Max and Arlo flourished. Arlo studied with Toronto Blues legend and two-time Juno nominee Michael Pickett, when he was 6 years old. Arlo currently studies drums with Joseph Janisse, drummer of the rock group â€œRocketfaceâ€?. Hudu Rising Blues Band began by playing at various events and private parties in and around the Toronto area since 2004. They have played at events such as the Scotia Bank Toronto Buskerfest, Toronto Cabbagetown Festival, the Woodbridge Fall Fair and the Woodbridge Ribfest.